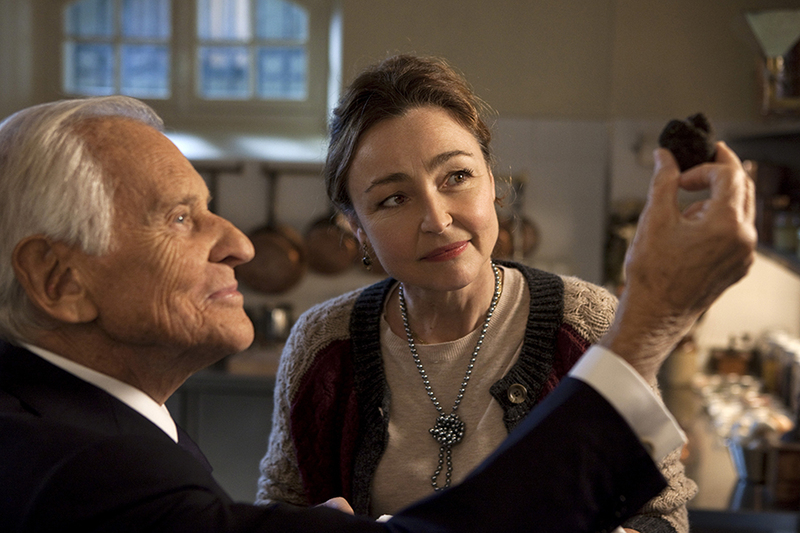 Jean d’Ormesson stars as the President and Catherine Frot stars as Hortense in Haute Cuisine, the latest movie about the bittersweet pleasures of French cooking. Via The Weinstein Company. This post was originally published on the Film Forum blog at FresnoFilmworks.org. Disclaimer: I serve as President on the Filmworks board of directors. Movie lovers have long developed a hearty appetite for films about international food. The Danes have Babette’s Feast, the Mexicans have Like Water for Chocolate, the Italians have Big Night, and the Japanese have Jiro Dreams of Sushi. Of course, there are many others. The status of French cuisine around the world has left its imprint on foodie movies, too. For more than a century, French cooking has symbolized intricate preparation and gourmet taste. On Dec. 13, Filmworks presents the latest film about French food, the political comedy Haute Cuisine. The movie – loosely based on the memoir of Danièle Mazet-Delpeuch, who served for several years as private chef to French president François Mitterrand – tells the story of Hortense, a no-nonsense cook with exacting standards but deceptively simple taste and technique. She becomes the first woman to prepare food in the Elysée Palace, as she navigates the jealousy and backbiting of the all-male kitchen staff. Haute Cuisine comes from a long line of recent movies about French food that have inspired popular international productions. Based on a 1999 novel by British author Joanne Harris, the 2000 comic fable Chocolat stars Juliette Binoche as a chocolatier who arrives in a repressed French village and changes the lives of the townspeople with her rich chocolate concoctions. Produced by the renowned Pixar Animation Studios, the 2007 animated comedy Ratatouille tells the story of an ambitious young rat named Remy who befriends a bumbling garbage boy. The unlikely pair joins forces in their mutual aspiration to become the finest chef in Paris. Based on two books – a 2005 memoir by blogger Julie Powell and the 2006 autobiography of renowned chef Julia Child – the 2009 dramatic comedy Julie & Julia stars Amy Adams and Meryl Streep. The movie, directed by American novelist and filmmaker Nora Ephron, weaves together the story of Powell, who in one year cooked her way through all 524 recipes in Child’s famous cookbook Mastering the Art of French Cooking, with the story of Child, the master cook and TV personality largely credited with introducing French cooking to the United States.